While hardy fuchsias are relatively easy to care for, a little extra attention can help them become even more beautiful and healthy plants. The following is part of our ongoing “Fuchsias 101” series of articles about hardy fuchsias by PowellsWood gardener and consultant Jackie LaVerne. Did you know that hardy fuchsias fare well in the climate of the Pacific Northwest? They bring color and interest to the garden throughout the summer and into late fall, and are a draw for hummingbirds, dragonflies, and bees. And growing them is easier than you think! The following is part of our ongoing “Fuchsias 101” series of articles by PowellsWood gardener and consultant Jackie LaVerne. What?! Did that say eat fuchsia berries?! Yes! It did! It does not seem to be commonly known to folks who are growing fuchsias in their gardens that they are growing berries. Usually people think of those dark squishy things as a menace and a mess in their yards. But they are actually very tasty berries that can be used in many ways, including salads, muffins, tarts, garnishes, jams, jellies, even pies. Click through for some delightful surprises! What are Encliandra fuchsias? 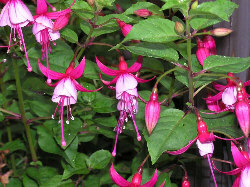 Well, they are often described as the miniature or dwarf-flowered fuchsias. Encliandras are fuchsias that are primarily from Mexico, high up in the mountain regions where it is cool, dry and foggy. They have extremely small flowers, generally less than 1/2-inch long, and some less than 1/8-inch long. The leaves on the plants are also very small compared to the regular species and cultivars of fuchsias. Click through to read more about these very heavy bloomers! Beginning with today’s article, we’d like to introduce you to a new series we’ll be publishing from time to time, written by our own on-hand fuchsia expert, Jackie LaVerne. In this series, “Fuchsias 101,” Jackie will be sharing many of the invaluable things she’s learned over the years as a grower of hardy fuchsias. Jackie owns Magellanica Gardens nursery specializing in hardy fuchsias, and is a regular contributor to garden publications and a popular presenter at garden events. Jackie is also busy here at PowellsWood as a gardener and consultant. Click through for Jackie’s first article! Here it is dumping rain outside and I am going to talk about heat and fuchsias. But summer is here and heat is coming. We have had extremely hot days and very cold days all mixed up together so far this year and our fuchsias seem a little confused, and so do we. With all the strange weather, the fuchsias do not seem to know what to do — bloom to survive or grow and get big? Well, they will do both if the weather will be changing up. But, with July and August on our feet, the weather will be heating up. Fuchsias love the sun, and they show their appreciation by blooming their hearts out. Click through to learn more!